Everyone who has a lawn wants the grass to be green and lush. Proper watering is essential if your lawn is going to be healthy. Don’t take watering your lawn for granted. Proper lawn care means knowing how and when to mow your lawn. This is important if you want to get the most out of your lawn irrigation system. Summer weather conditions can be brutal on grass. Watering lawns and gardens helps decrease drought stress during dry periods during the summer. Using your water incorrectly will just cost you money. 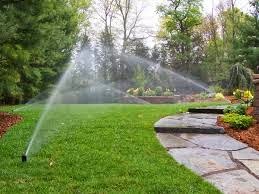 You’ll end up spending more money on your water bill and your lawn will not benefit. Using your water sprinkler system on a windy day can be wasteful. The water will be distributed unevenly and much of it will be lost to evaporation. Timing matters too. The best time to water your lawn is during the early morning hours, before the sun is at its strongest. The air also tends to be cooler and there is usually less wind. Watering in the middle of the day means the sun will dry out the lawn too quickly. Water may evaporate before it has a chance to reach the roots. Watering in the evening means the water may sit too long without being absorbed. This can cause problems with fungus. Ideally the water should soak six inches into the soil. The reasons above are just some of the reasons a lawn sprinkler system can make a lot of sense. These systems allow you to use a timer to choose when to water the lawn. The timers turn the system on, and your lawn gets a much-needed drink. Many lawns will only need to be watered twice a week. This is why a little knowledge can go a long way in ensuring you have a green, healthy lawn.